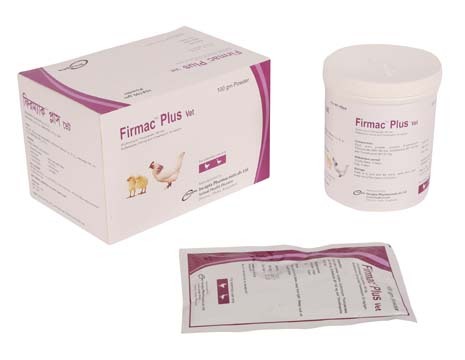 Firmac Plus: Each gram powder contains Erythromycin Thiocyanate INN 180 mg, Sulfadiazine BP 150 mg and Trimethoprim BP 30 mg. The ingredients of Erythromycin, Sulphadiazine and Trimethoprim are antifolate drug that inhibits bacterial protein synthesis, antifolate drugs and able to kill bacteria. The combination has synergistic activity against wide spectrum of microorganisms, effective at low dose, besides gram positive and gram negative baeteria it is effective against mycolplasma, campylobacter, ricketssia and Chlamydia. The combination have 90-100% bioavailability which is very effective to kill bacteria. Erythromycin, Sulphadiazine & Trimethoprim is indicated in infectious coryza, fowl cholera, fowl typhoid, pullorum disease, chronic respiratory disease (CRD), Colisepticemia and enteritis of poultry. 0.5-1 g/litter of drinking water continues for 3-5 consecutive days, dose may be increased or decreased according to the severity of infection or as directed by the registered veterinarian. The combination is well tolerated and does not show any side effect in poultry at the recommended dose. Treatment would be stopped before 5 days of slaughter. Sufficient clinical data not available.